FindBugs can be executed using Maven in two different modes: as stand-alone command or as part of the Maven site command. These two modes require different settings in the project pom.xml but they are not incompatible to each other so we can use both of them. You can find complete Maven project here. Please note that the FindBugs plugin definition is inside build – plugins section of the pom file. FindBugs analyze the compiled files (*.class). If the project is not compiled or just cleaned, FindBugs will report nothing, without error messages. So take care to build your project before running FindBugs. A warnings number is reported on the console. Warnings are possible bugs found by the FindBugs detectors. The warnings details are included in a report created in the file target/findbugsXml.xml which is in XML format and so not really readable. The FindBugs window shows the bugs on the left, the (read-only) code on the right and the bug explanation below. You can filter bugs for bug rank from the most critical (“scariest”) to trivial and even, saving project status, comparing project evolution (which means how may bugs has been eliminated/introduced after previous FindBugs check). 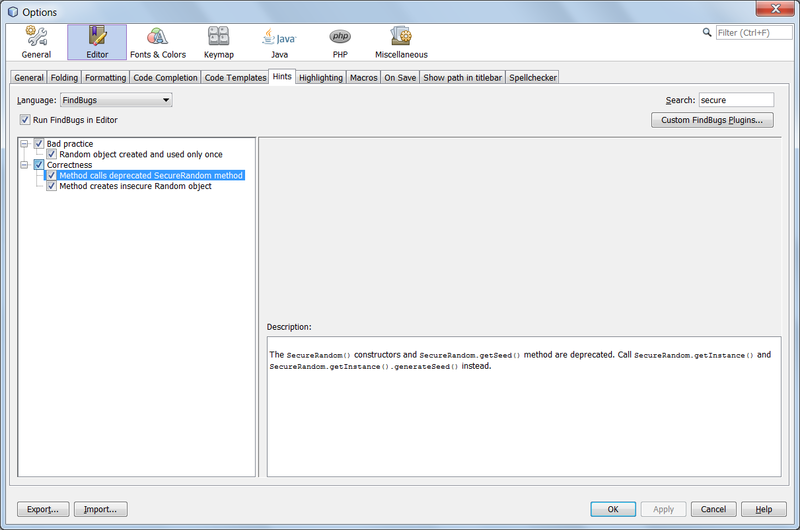 All main IDEs (Eclipse, NetBeans, IntelliJ) FindBugs plugins show similar views and they can also let you modify the code so I don’t suggest to use FindBugs native GUI unless you have to create exclusion files (see below) which is easier with the native GUI: select a bug, filter it out and export bug filters. Maven site command is used to generate a project “site”, which is a collection of information on the project nicely reported in HTML pages. You can configure which information is included in the site report and, of course, you can add FindBugs analysis results. Maven site requires a “reporting section” in the pom file. [WARNING] No project URL defined - decoration links will not be relativized! [INFO] Skipped "Source Xref" report, file "xref/index.html" already exists for the English version. The report is interesting because it give us the complete picture of our project in the summary section but also the list of the files which have FindBugs detected issues with all details including the priority (i.e. how dangerous could be the problem). Configurations in the build and reporting sections are independent so we can have two different settings in the two modes, stand-alone and site. Best practice is to use a light and fast configuration on the standalone mode, in order to run quick checks during development and an high effort, production quality configuration for the site mode. 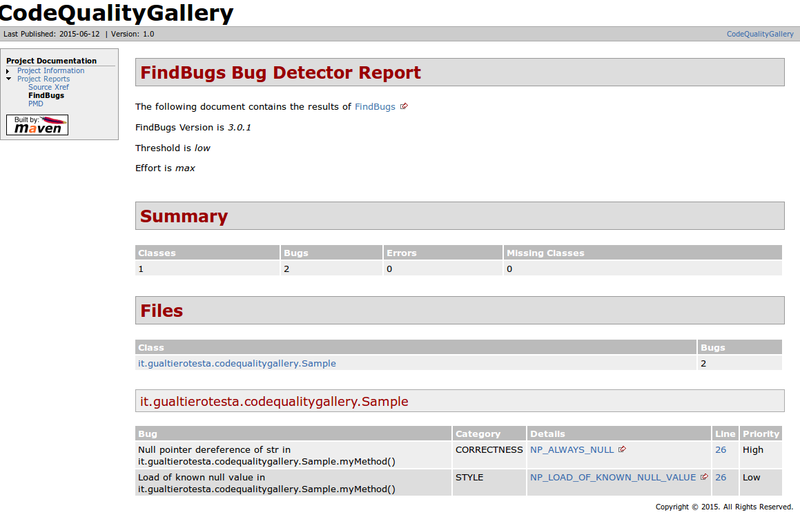 DEBUG: With <debug>true</debug> option, FindBugs will show what is doing during analysis. Useful to fine tune or checks the settings. EFFORT: with <effort>Max</effort> we can increase the time FindBugs is allowed to use to analyze the code. More effort means more accurate analysis but, of course, FindBugs run slower. EXTERNAL PLUGINS: FindBugs can be extended with additional detectors. See my post on the topic. 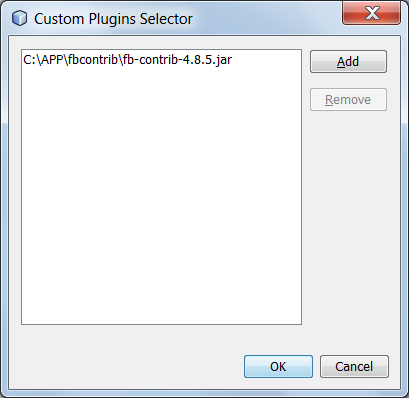 The <pluginList>plugin1[, plugin2…]</pluginList> configuration option list the plugins to be used. See the sample project for a real example. EXCLUSIONS: If you need to disable a detector or to disable the analysis on same classes, an exclude list can be specified with the <excludeFilterFile> path_to_exclude_file </excludeFilterFile> option. File syntax is documented here. An easy way to create this file is by using the FindBugs GUI which has an export filter function. See the sample project for a real example. 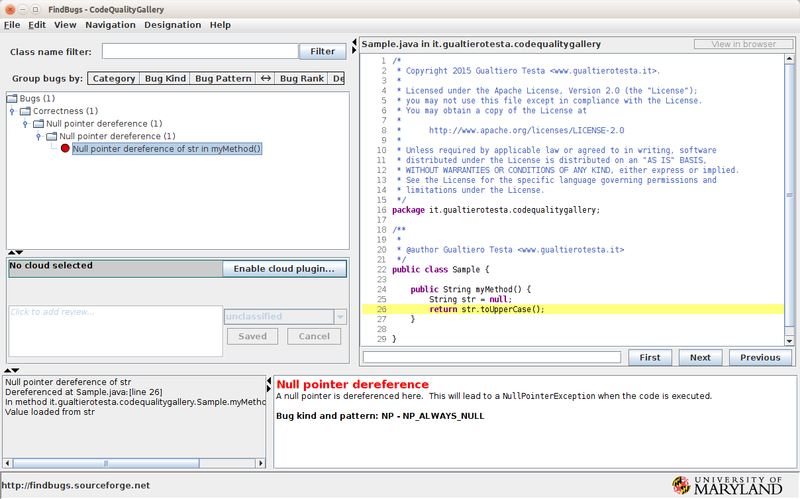 FindBugs is a key code quality tool for Java based projects. It includes several dozens of bug patterns which are used by FindBugs to identify potential bugs and, more in general, weaknesses in our code. FindBugs has a plugin architecture which can be used to extend the set of detectors (bug patterns) used during the analysis. There are few open source projects which aim to develop FindBugs plugin. My preferred one is Fb-Contrib which contains a significant amount of additional detectors. See here for the complete list. Most of them are really useful to detect poor code quality. Another interesting plugin is Find Security Bugs; the focus here is on security vulnerabilities (list here) like using unsecured random generator or not checking data received from the user. 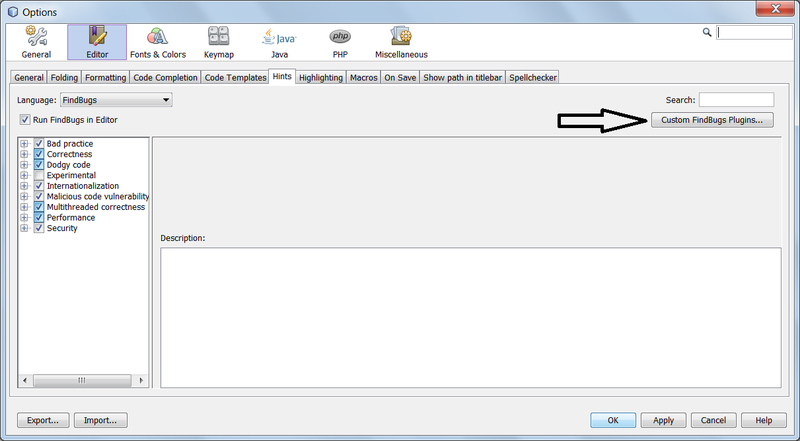 NetBeans FindBugs integration: use Custom FindBugs Plugins button inside Editor → Hints → FindBugs page. IntelliJ FindBugs plugin: add new plugin in the Plugin Configuration tab. After adding new plugins, review the list of detectors enabled. New detectors are usually added but not enabled. In NetBeans 7.4, the FindBugs integration inside the IDE has been improved giving us the possibility to specify additional rules to be checked. FindBugs has a plugin architecture that let user to add custom rules sets. I usually add FindBugs rules from FBContrib, a FindBugs auxiliary rules set. There are hundred of rules included in FBContrib. Complete list can be found here. 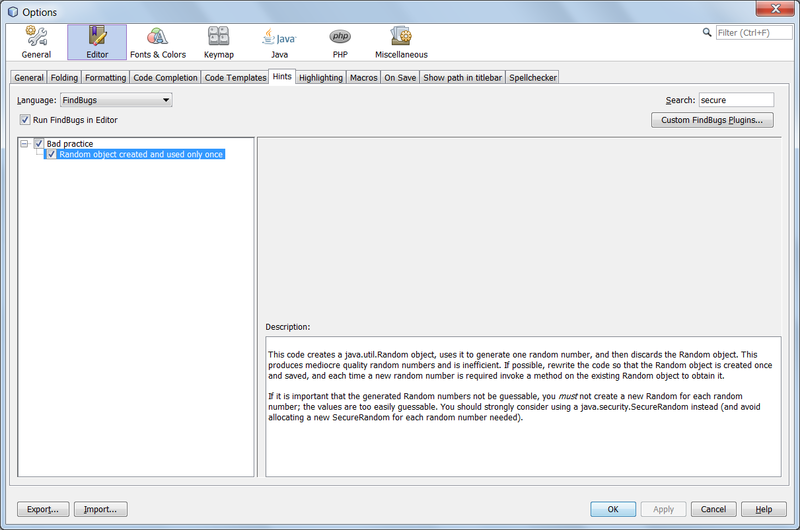 What is amazing in NetBeans is that not only you can tell the IDE to use the additional rules sets but that the new rules are seamless integrated in the NetBeans interface. For example, FBContrib rules are grouped together with standard FindBugs checks. Press “Custom FindBugs Plugins” button. The “Add” button let us specify one or more additional jar files. As I already mentioned, the rules included in the FBContrib jar file are integrated with the other native FindBugs rules. Both native and FBContrib rules can be enabled and disabled one by one. With NetBeans Hints, FindBugs and, may be, PMD (see this post on PMD plugin ) all enabled there is a good chance that one problematic line can have more than one warning. In this case I suggest to keep native NetBeans hints enabled and disable the check in the other tools, mainly because NetBeans native checks are faster.